I have only played a handful of arcade flight/shooter games in my 33 years+ of gaming as it’s a genre that never really held much appeal to me. I enjoyed older titles in the X-Wing series of games but that’s really about as far as my gaming went when it comes to flight-based games. 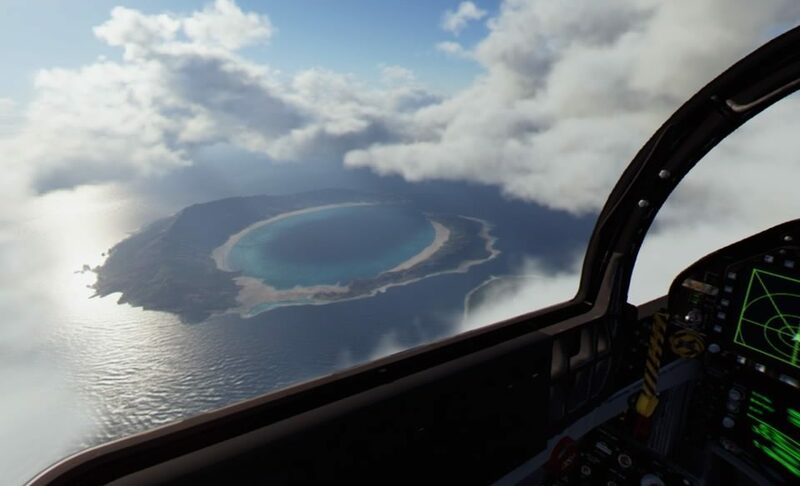 That all changed with VR and games like Eve Valkyrie and Ultra Wings showcased just how immersive piloting a lone air craft can be with games utilizing flight mechanics quickly becoming some of my most favorite VR experiences ever. 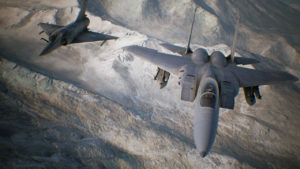 Ace Combat is a franchise that has been around since the mid 90’s offering top quality shooter experiences in the vein of movies like Top Gun and Iron Eagle but with its own Japanese flare and now that series has come to the PlayStation VR headset after an extended delay with only a fraction of VR content when compared the non-VR offerings. So right off the hop you are going to need a DS4 and for those looking for a little extra immersion, the HOTAS controllers are also supported. Thumb sticks control pitch and angle with the rest of the game playing exactly like it would out of VR making it feel very much like a traditional arcade flight-shooter. The HOTAS adds a new level as it’s a thrill to see the joystick in your hand emulated wonderfully in the headset. Skies Unknown only features 3 full stages in VR with an additional free-flight mode, Hanger area when you can view your planes and an Air Show Mode that lets you watch and pick the death defying moves the planes perform while you watch from the sidelines. Besides the 3 VR missions though, the other content really just feels like fluff and while I appreciate their inclusion, it’s not why I bought the game. The VR missions are exclusive to the headset and take place 5 years before the main campaign story. I have never played an Ace Combat game before so I’m unclear about any previous story-lines or universe specific details but the bottom line is that you are a good guy and it’s your job to shoot down and destroy the bad guys. It’s worth noting that there are zero comfort settings in the game so for those that may have a sensitive stomach, you have been warned as the jet flying in this game is all simulation. So how does the game’s look translate to VR? I’m happy to say that it is one of the best-looking experiences to ever grace our headset. When I sat in my cockpit and the game auto drove my plane into take-off position on a carrier, I was slightly underwhelmed by the pixelated people busy around me. Taking to the skies washed away that lackluster 1st impression and I was instantly blown away by the look and feel of the game. Soaring over the open ocean is breathtaking, especially at top speeds, and once I got comfortable with the controls and started to play around, I was having an absolute blast skirting the ground, performing barrel rolls and dizzying maneuvers that were very disorienting…and I loved every second. Each stage has a completely different look as you cruise over open waters, farm lands and a mountainside, with the former and latter looking stunning. As I climbed to exhilarating heights and dove and incredible speeds, I couldn’t help but be so satisfied at what was before my eyes. Hitting the clouds sprays your cockpit with condensation which quickly wisps away once you leave them and flying in tandem with an ally is just so damned cool. Perhaps one of the biggest visual thrills is destroying an enemy fighter in front you and flying through his explosion while watching his remains careen toward the ground. Speaking of the ground, it’s the one foible in what is otherwise a near perfect visual experience and getting to close reveals a lack of detail, though getting to close is typically not a good idea anyways. The air show bit looks pretty slick as well with you standing on the deck of the carrier as jets fly overhead and it’s cool to see their jet streams in the water. A large focus was clearly put on the audio side of things with a ton of military chatter throughout each of the missions. You squad mates and operations comment on your actions, whether it’s a successful kill or if an enemy is lining you up. The fighter jets sound amazing and hearing the explosions of a successful hit or flying to close to another craft just to hear the whine of their engines is an absolute blast. I wasn’t the biggest fan of the 90’s style Japanese action melodies, but they never offended and once the action ramped up, completely disappeared as I was to focused on shooting and flying to pay attention to anything else. Bottom line is that the VR presentation in Ace Combat 7 is top quality! So, the largest issue with the VR content is that it is limited to those 3 missions and the meager offerings of the air show and free flight content. While some people may be able to crush the VR campaign in 45 minutes, it took me closer to 3 hours to wrap those missions…on easy mode. I’m not saying everyone out there is at the same skill level as I am, but I think anyone mentioning that the play time is less then an hour is looking to hate a bit as normal and hard modes offer a dramatically increased amount of challenge. There are also advanced or simple controls to play around with ensuring that those of any skill will be faced with a challenge that should take way longer and hour of play time. Don’t get me wrong, I wish there was way more content here but once I got into the game, I quickly forgot about anything else except for surviving and taking out the enemy. Hard to hate on anything else here as flying around while anti-aircraft is trying to take you out if you get to low and flying to high puts you in a hectic dog-fight. I strained the heck out of my neck just looking around to spot my next target and having the freedom to do that in VR is a trade I will make every time if my only other option is to play flat. Heck even just looking back and seeing my plane behind me or watching an enemy maneuver out of my sights and still be able to follow him with the eyes as he fly’s around makes this an unparalleled VR experience. 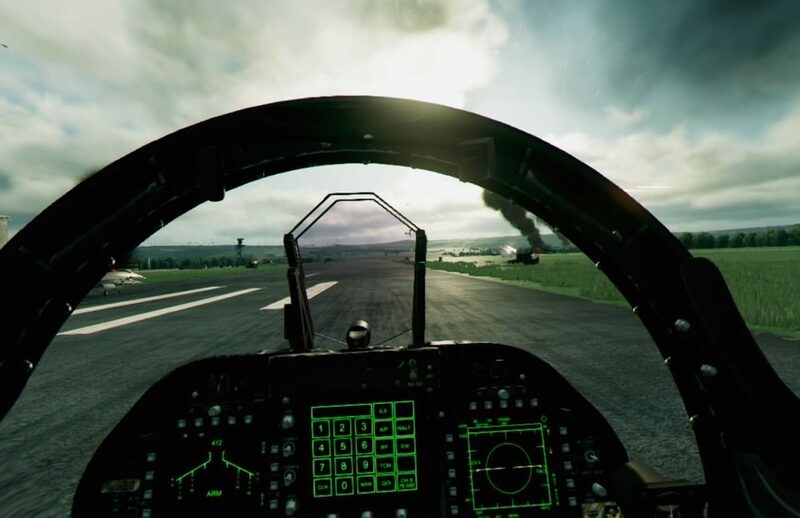 These kinds of cockpit experiences were built for VR and when combined with the AAA presentation makes this a game not to miss for the PlayStation VR, with PC VR users forced to wait a year for access to the VR content. The content may still seem light for the price but I’ve honestly payed the same for other VR games and have felt more ripped off then how I felt after playing through the content here. Ace Combat 7 gave me some of the most fun I have ever had in VR and delivers top quality presentation and I urge everyone who is curious about this title to give it a shot. What would I pay? I payed the full retail asking price and I honestly don’t regret it at all. Ace Combat 7 offers up a AAA flight experience that lasted me a few hours of play on my first run through and I can’t wait to hop back in a try my skills on harder difficulty settings. You are paying for quality over quantity here but even if this drops from the $60 asking price to let’s say $40, I’d say it’s definitely worth that investment.